So let’s start by getting back to basics, breaking down the who, what, where, when and how when it comes to the kidneys. The Who: Who needs to be concerned about the kidneys and kidney disease? In an ideal world, everyone would have their kidneys on their radar, but the one in three American adults at risk for kidney disease definitely should be concerned about their kidneys. Those who fall in this category include people with the major risk factors for kidney disease: high blood pressure, diabetes, family history of kidney failure and being over age 60. Even if you aren’t at high risk for kidney disease, everyone can benefit from learning more about the kidneys and keeping them healthy. A urine test for albumin, a type of protein. Protein in the urine is one of the earliest signs of kidney damage. When there is too much protein in the urine, it means that the kidneys’ filters have been damaged and are starting to leak protein. The How: Testing and prevention go hand-in-hand and knowing how to keep your kidneys healthy is an important element of preventing kidney disease. 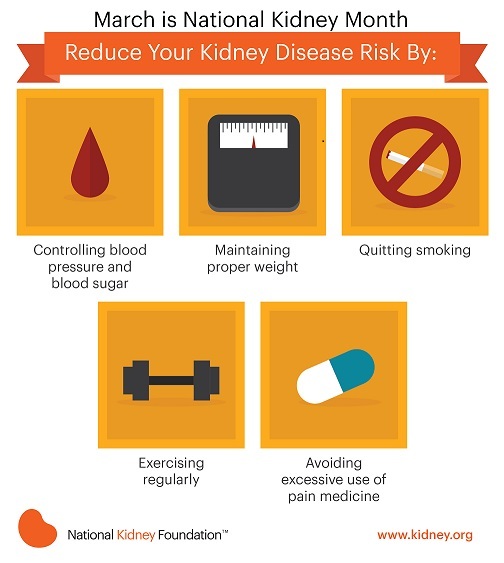 Following a healthy lifestyle is key to keeping the kidneys healthy! This includes exercising regularly, eating healthy foods and avoiding consuming high levels of salt and sodium, maintaining a healthy weight, quitting (or never even starting) smoking, controlling high blood pressure and diabetes and only taking pain medications as prescribed on the label — for the shortest amount of time possible, at the lowest effective dose. For more information about the kidneys and kidney disease, visit the National Kidney Foundation’s website at www.kidney.org.